Frizzle Fraz 3 is here with the latest version of this free online adventure game and you will be the one guiding the purple one. The goal here is to collect all the golden coins that you possibly see on the way. Also there will be some tough to reach areas that you need to explore as there might be some treasures out there as well. 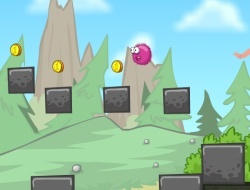 Another key to winning the levels with a great high score is that you need to rescue the smaller frizzles because they are not as big as strong and bouncy like you are. Do your best to save them and kill anyone by stomping on their heads. Frizzle Fraz 3 0.00 between 0 and 10 based on 0 votes.